Splash pages, you gotta love 'em. A blank canvas where the artist can hit you with a large dose of illustrated 'wow'. 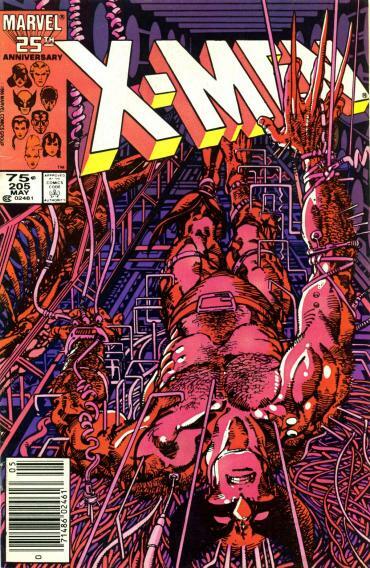 This week, the splash from what I state is one of Wolverine's highly-unsung yet definitive issues, Uncanny X-Men #205. 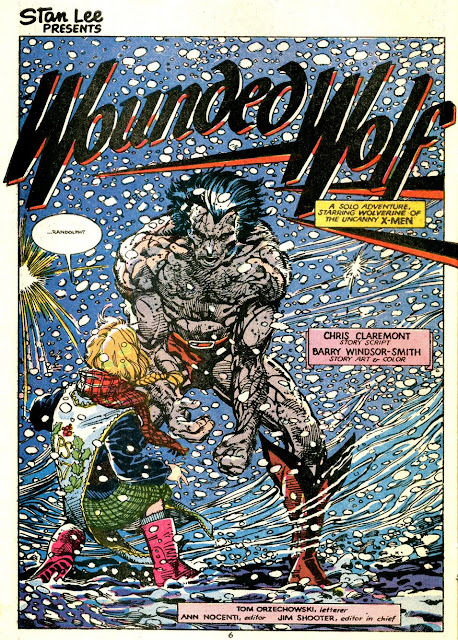 Drawn by industry icon Barry Windsor-Smith, an on the run feral Logan meets Katie Power from Power Pack. Few people can draw Wolverine any better than BWS, and as an injured and amnesiac Wolverine flees and fights Lady Deathstrike and her Reavers through the festive season snow, you start to wonder if this tale of savagery meets innocence wasn't the catalyst for the creation of Jubilee (or was Katie originally intended to be Jubilee give their powers are visually similar? ), especially given the exchange of friendship at the end. What do you think? A done in one tale from one of the great era's in X-Men lore, if you haven't read the issue yet, track down a copy soon at your nearest back-issue bin. For more great splashies click here. I'm proud to say I actually own this very issue Dan. It's not a cheap find I'll tell you that, but I was lucky enough to find a mint copy for only 2$ at a flea market. Yeah, few can draw like BWS, so this rendition along with the whole 13-part Weapon X saga stands as an iconic take on Wolverine. As for Katie being the inspiration later on for Jubilee, maybe, but I do know the X-Men and Power Pack met up a few times through out the 80's. oh bugger i used to have this issue. i loved how Logan got the drop on each of those cyborg blokes one at a time until the final show down. Looks like it was a pretty popular issue all round huh guys? I have to say Robert I pick the issue up a fair but just to see how well BWS handles Wolverine slowly taking down the opposition. Like you say Dave, it's great stuff. Dale while X-Men and Power Pack did meet a fair bit, this I feel was the best of the bunch. You have given me an idea though - this weekend I'm going flea-marketing to see what I can find!